Hi, peeps! Long time no chat, eh? Some exciting things have been going on lately. First of all, I was out of town for 10 days before and during the 4th holiday weekend. I was in Daytona Beach for a few days with my mom and sister before shipping up to Boston for a family wedding. Some of the highlights of the trip included visiting some of my favorite Daytona restaurants I’ve missed so much, the beach, Dunkin’ iced coffee (obviously), lobster rolls, and rainstorms. Rain? Who am I? Seriously though, after 3 months straight without a drop here, the summer rain was super refreshing. I get plenty of sun at home now. In other news, I am finally employed again! I came back from my vacation and went straight to work the next day. So when my vacation was over, my 6-month indefinite vacation was over, too! Hooray! Preheat oven to 400 degrees. Lightly grease a 1 1/2 to 2-quart casserole dish. Toss the squash and potatoes with the olive oil in a large bowl. Place 1/3 of the squash and potato slices evenly in the bottom of the dish. Season with salt and pepper. 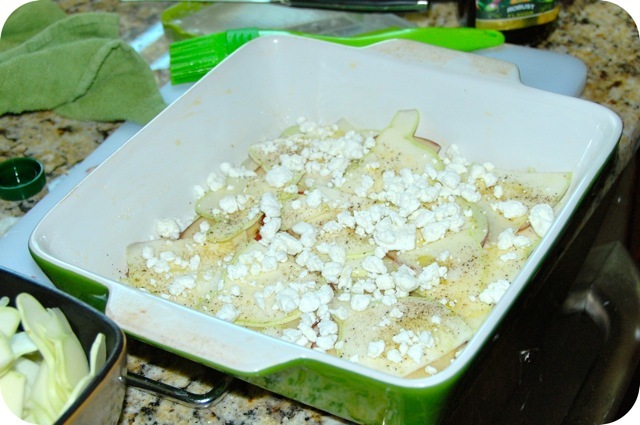 Top with half of the goat cheese, scattered evenly in chunks. Repeat with another 1/3 of the vegetables, seasoning again with salt and pepper and topping with the other 1/2 of the goat cheese. Finish by layering on the final 1/3 of the vegetables and seasoning with salt and pepper. 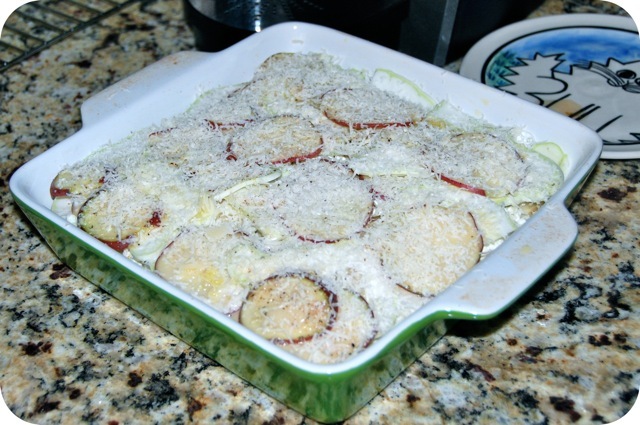 Pour the milk over the entire dish, and sprinkle the Parmesan cheese over top. Bake, covered, for 40 minutes, then uncover and bake 20 more minutes, until top is browned. 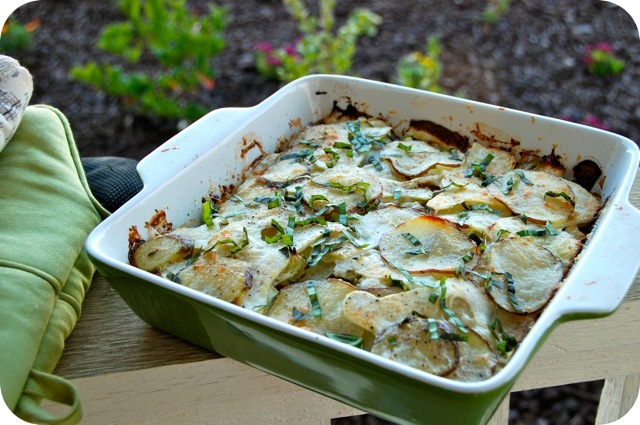 Sprinkle the basil over top and serve. Adventures in Gardening: Let's Try Again! Congrats on the job! A little bit of “extended vacation” is nice, but I’m sure you were ready to get out of the house and back into the working world. And this looks so tasty! 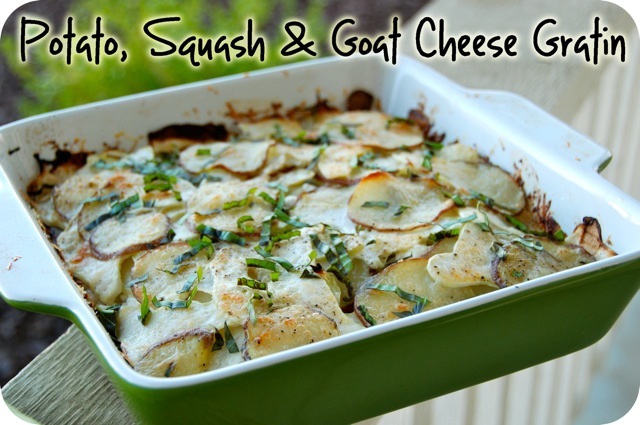 Potatoes, squash, goat cheese, oh my!